I’ve only had this for a week and I’m already loving it. The first thing to note is its action. Yamaha calls this Graded Hammer Standard (GHS), which is the most entry-level of Yamaha’s fully-weighted systems. The keys tend to be heavier than most uprights, and comparable to the average grand piano (a little heavier than Yamaha but lighter than Steinway). The lower keys are weighted more heavily to simulate the physics of a real piano. It took me a day or two to get accustomed to the weight, but now it feels totally natural. GHS is not going to be as good as GH/GHE/GH3 for repeated notes. For playing middle C as 16th notes, it starts to get muddy around 120 with somewhat sloppy technique (but is fine on good technique), becomes significantly more difficult to play around 160, and becomes almost impossible at 200 even with the best technique. I’m sure a higher-end keyboard will be better at this, but in practice there just aren’t that many pieces that require 16th note repetition above 120, so it’s not a dealbreaker. The sound quality is very good. Turning up the volume to max with touch sensitivity set to normal produces a response which is most similar to an acoustic piano. If you use headphones, you might want to turn it down a bit, or it will hurt your ears. Throughout the range, the response is very realistic, down to a pianissimo, though fortissimo could be louder and have a more brilliant timbre. You can choose from a regular grand piano or a mellower or brighter version of it. Initially I found the default to be a bit too mellow, but I eventually got used to it; it’s only a matter of personal preference. There are other voices but I don’t know if I’d ever use them (except perhaps the harpsichord). If you want tons of voices and fancy features then get the DGX650 instead. As for accurately recreating the sympathetic effects of an acoustic piano, it has the basics down. A note played and held without pedal sounds different from a note played and held with pedal. With a good pedal like the LP5A, half-pedaling is supported. If you press the pedal, play a note, release the note, press the note again without making a sound, and release the pedal, the note will still be sustained. However, if you hold down one key without making a sound and play the same note an octave away (and release), the key will not sound, suggesting that sympathetic resonance is only simulated locally without regards to other keys which are pressed. 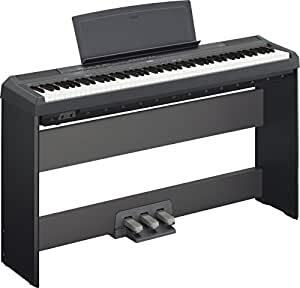 This keyboard is for beginners who want a piano with realistic action but don’t want to shell out thousands for an acoustic before deciding whether to continue learning piano, or advanced amateurs who used to play piano growing up but have now moved out and can’t fit a real piano in their new place or justify the expense. I’m the latter case, but I wish I had such a piano when starting out. We got an upright piano about 2-3 years into my learning, and before that I was playing on an unweighted Yamaha that couldn’t even produce dynamics. If you’re considering a $100 piano, I highly urge you to get this one instead. If you can afford the tuition, then you can afford the $400 difference in price to get a vastly different learning experience. The weight is substantial but still portable. The best way to describe it is: I wouldn’t want to drag around all the time to perform, but it is very easy to set up in a small apartment and put away in storage when it is not needed. EDIT: I stopped by Guitar Center the other day and tested out some other pianos for fun. Compared to the P-115, the Casio PX-160 (its main competitor) has somewhat heavier action and synthetic ivory/ebony keys which some people prefer, but the sound quality of the P-115 is better in my opinion. The pedaling effects are quite similar. Ultimately there are many more similarities between the two than differences and you can’t go wrong with either. Words cannot describe the joy I feel when my boy (13) plays. He loves this thing! He learned for nearly two years on a $100 Casio keyboard with brittle keys that broke regularly. This keyboard was quite a leap forward and he plays it for hours each day. My mother was a piano teacher so I grew up listening to her play amazing classical pieces. Now my son is playing those pieces and composing his own and this piano sounds so rich and surprisingly similar to a non-digital piano. His playing has definitely improved since the keys are weighted properly. He also enjoys the app on the iPad and the features available while using it. Great choice for our family as space was an issue. Even if it wasn’t, I might still choose this keyboard. I am kicking myself for not getting this years ago. It is so perfect. I love the built in metronome which is essential for practice on so many instruments. Now that my daughters are taking guitar, drums, and piano I am super appreciative of this feature. You can also change it to drum rhythm which is more fun than the metronome sound. This lacks synth features like pitch wheels and crazy synth sounds. The built in instruments are limited, but that is good thing for what this is. It helps stay focused on piano. I am slightly annoyed there isnât an old school midi port, but that is because I have an old midi module. The built in speakers arenât half bad. I am OCD about speakers and amps, but happy that they do just fine. Less space and easier setup this way for bedroom practicing. I bought this for my daughter. At first I was skeptical about buying this because of the little speakers on the top but Those aren’t the only speakers, there are full sized speakers on the underside. She had a Yamaha keyboard that didn’t have all the keys and wasnt weighted and it sounded good but not as good as this. The bad thing is it came with a X stand. The piano slides around on the top. There is nothing to lock the piano on the top and you can’t put your legs under it. The piano comes with a cheap peddle but the yamaha peddle in the bundle seemed to be a quality peddle, feels firm when you step on it and has some weight to it. The bench…ehhh pretty cheap but will do.